By Antonia van de VeldeTHESSALONIKI, Greece — He swayed to the music of "Zorba the Greek" before his race, and afterward took time to sign autographs for a swarm of children at Kaftanzoglio stadium. Now that his record-breaking season is over, Usain Bolt said Sunday he has one remaining priority: "Sleep!" The Jamaican is looking forward to six weeks of quiet after he flies home to Jamaica on Monday — following a season that saw the 23-year-old smash his own 100 and 200-meter records at the world championships last month. On Sunday, Bolt added another easy win at the World Athletics Final, taking the 200 in 19.68 seconds. Wallace Spearmon of the United States was second in 20.21, and Brendan Christian of Antigua third in 20.65. "I was running on fumes. That was the last race this year. ... 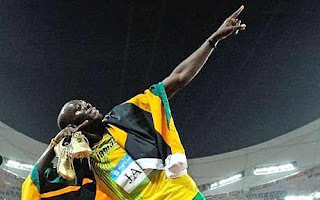 It was the last energy I had," Bolt said. "I'm just happy the season is over ... I was really tired. Hopefully I'll get lots of rest. I'm not looking forward to any one thing. I just want to go home." In Greece, Bolt skipped the 100 on Saturday, but still did his best to be a crowd-pleaser. He visited a local school and ran onto the track at Kaftanzoglio Saturday just to make an appearance. This week, he pulled out of meets in China and South Korea because of fatigue, stretching his break to six weeks. "I usually get a month, so six weeks is even better," he said. "When you run 10 and a half months out of 12 months, you don't really miss running. ... When it's coming close to a race you think, 'Ah, here we go again.'" Instead of training, Bolt said he's hoping to enjoy doing ordinary things. "I'm looking forward to playing video games, going to the club, that's pretty much it," he said. "I'm the kind of guy who stays home, plays music and chills out."